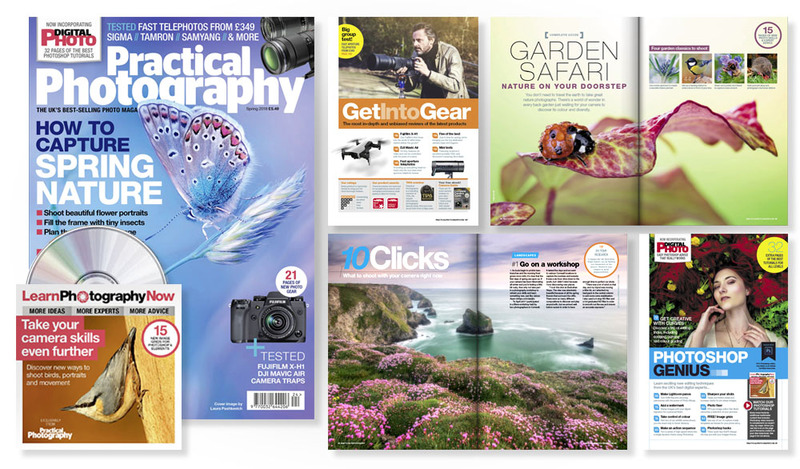 Get 4 wildlife tips cards, 15 custom image grids for Photoshop and Elements, 60 minutes of new how-to videos including Simon Roy’s bird photography masterclass, and an updated camera buyer’s ebook. Discover a world of wildlife wonder close to home with our 15-page guide to four classic subjects – flowers, birds, insects and mammals. Experts Mandy Disher, Simon Roy, Ross Hoddinott and Allanah Walker share their insight. From perfect skin to edgy editorial, we show you how to create flawless portraits with three DIY beauty ideas. Add colour with flash, go macro with your kit lens, and use unusual props to grab your viewers’ attention. Turn RAW files into stunning panoramas, get creative with Curves, add a personal watermark, add colour and saturation to your wildlife shots, make a high-speed action sequence, and many more editing projects. Delve into your camera’s white balance settings to ensure colour accuracy and find out how to create a custom and manual white balance. Take a first look at Fuji’s exciting X-H1 hybrid CSC, go flying with DJI’s Mavic Air drone, find the best fast telephoto lens from £349, and compare camera traps for intimate wildlife shots.